The series 2 EMS has some new features over the Series 1 box. It's a all new platform that is no longer tied to the GEMs hardware. The new unit has 12 peak and hold injectors so a resistor box is no longer needed. It runs in direct fire so wasted spark is no longer used and a smoother, factory quality idle can be had. It uses either a serial port or usb so hunting around for older laptops will be a thing of the past. The internal logging has an increased capacity. With the series two you can password protect your maps so if your tuning and don't want your work looked by others you have that option. 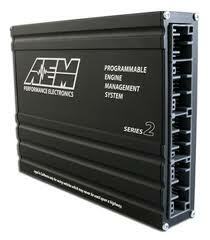 It will work with the existing gauges so your AEM wideband or serial gauge will be a direct transition. For people just getting into tuning the all new AEM tuner software gives a simple approach with all the advanced features still in place, but in the backround for when you really want to dig in. Please select your application. If your application isn't listed please email us for pricing!